Fast connect rope access and rigging harness with ergonomically designed shoulder, waist and leg pads for greater user comfort. Multi-functional harness developed for rope access and rigging but suitable for all work at height. 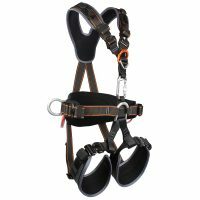 The MATRIX harness can be used for rigging, it has ergonomically designed shoulder, waist and leg pads for greater comfort. Waist section is articulated for maximum freedom of movement and comfort when not suspended. When the user is suspended from the waist D-ring the leg loops lift into a sitting position. When not suspended, the waist attachment moves downwards allowing the user to stand up straight. Alloy karabiner connects to a loop behind waist D-ring. Hook free gate prevents snagging and reduces potential webbing damage. Ergonomically contoured pads are shaped and formed for comfort. 3 dimensional forming and plastic inserts provide support where it is needed but allow movement in essential areas. Quick connected leg loop buckles for quick and easy fitting. Standard buckles allow one handed adjustment with positive locking on chest and waist. Integral delta screwlink simplifies attachment and use of chest ascenders. Screwlink can be removed if not required. Side D-rings allow work positioning attachments and fold away discreetly when not required. Lightweight, durable gear loops with 20 kg rated load and 7:1 factor of safety. Accessories and tool bags can also be attached directly around the waist belt webbing. Complies with Siemens PPE requirements PRO-13838 Ap1. MATRIX – Rigging Harness fixed leg buckles – standard (H21), large (H21L).